Having freed himself from the Dead Zone, Garlic Jr. attacks Kame's lookout with the help of four new henchmen, trapping Kame and his assistant, Mr. Popo, in a bottle. He uses this opportunity to release the Aquamist, a gas that basically turns anyone it reaches into a demon. Meanwhile, Gohan has snuck away from home with Haiya Dragon in order to visit his friends. Krillin has a new girlfriend named Marron, and at the moment are with Bulma, Oolong, and Master Roshi at Kame house. The Aquamist reaches the island, transforming them all into demons (With the exception of Krillin and Marron, who were underwater when the mist passed over them). Gohan and his dragon manage to escape the effects as well. Having now reached the island, Gohan finds himself attacked by his friends. Garlic Jr.'s minions arrive, and inform Gohan of the Super Holy Water, the only thing that can counter the Aquamist. Piccolo comes to Gohan's rescue, but is bitten by one of the demons, and turns against our young hero, Gohan, as well. Upon reaching Kame's tower, Gohan meets Garlic Jr, who tells him how the Makyosei's (a red star) close approach to Earth freed him from the Dead Zone, and makes him stronger by the minute. 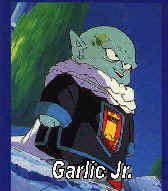 Garlic Jr. orders his men to focus their attacks on Gohan, because it was him that banished the evil lord to the Dead Zone in the first place (although Krillin still tries to help Gohan). Meanwhile, Vegeta is searching for Goku in deep space, hoping to keep up with his level of strength. Piccolo begins to attack Gohan one on one, and basically beats him silly. Krillin, getting in the way of the battle, is bitten by Piccolo, and joins in against Gohan. It is at this moment that Piccolo steals the bottle containing Kame and Popo from Garlic Jr. and releases them. Piccolo explains that since he is already a demon, the aquamist bite had no affect on him. Garlic Jr. becomes enraged, and the Makyosei approaches its apogee to Earth. Knowing that there is no way to release the Super Holy Water before daybreak, Popo suggests that it be poured into the holes beneath Kame's palace where the winds would carry it around the world. However, on the way to this place rests the bodies of all the previous Kame's, known as the Shinsenkai. Any living Kame that attempts to pass through this area is in great danger. As the battle with Garlic Jr. and his minions continues on the surface, Kame is attacked by the previous gods, who drain his life force. Since Piccolo and Kame are still spiritually linked, Piccolo begins to suffer in his battle. Despite the incredible amount of pain, Kame and Popo press on, finally reaching the bottom of the palace. With the dead gods busy attacking Kame, Popo manages to release the Super Holy Water, returning the Earth's population to normal.